MSN and Bing have featured a couple of National Geographic videos about apocalypse today. One video (link) supposes that the Moon moves out in orbit to 270000 miles (MSN titles it “If the Moon Moved”), 10% further. In that case, the gravity of Jupiter would take over Earth and it’s possible the Earth would start spinning on its side, like Uranus, with enormous and sudden climate changes wiping out civilization as we know it. Princeton University geosciences professor Adam Maloof (link) discusses the possibility of a sudden pole shift as a consequence of the Maya prophecy for 2012 in this video (link), along with Robert Bast. The video starts in Dec 21, 2012 with a reporter saying Congress is going into recess, which Washington is suddenly destroyed with a flare (as in the movie “Knowing”). The pole shift idea had been explored by novelist Allan W. Eckert in the 1970s with the novel “The Hab Theory”. After two rather big films about a post-apocalypse, we now have one as to how it could be experienced, if religion is right. That is Scott Stewart’s “Screen Gems” film “Legion”. (Screen Gems is Columbia-Sony’s genre brand, some would say for “B” movies). The best part of the film is in the middle, where customers at the Paradise Diner in the Mojave Desert (the film was actually made in New Mexico) learn that the whole world outside has gone “back to the bay”, and anxiously await news from the media (as in an M. Night Shyamalan movie). Instead they get weird guests gone mad, starting with an old lady who walks on the ceiling. It turns out that these “zombies” are weak people actually possessed by angels, who are about to carry out their battle, since God got mad at Man again. Now when you read about the psychology of radical terrorists, some seem “possessed” by religion, ideology, or runaway self-indulgent thinking, so the movie actually has a lesson to impart. But the "possessed" in real life seem to be the privileged, educated and well-off young men without enough responsibility for others. The official site for the movie is here. There is a bit of anti-Rosemary's Baby in the plot, as a child is born to an ordinary woman (a waitress) who just might lead the world out of darkness -- in a franchise sequel (will Tom Welling play the child when he grows up?) And the one "good man" (not sure which actor yet) grows tattoos on his arms, and loses his male body hair in the process. This is real horror. In my own novel draft, I have a proposal where people get infected by a bizarre virus (incorporating bizarre radioactive isotopes available only in a universe with the “weak force”) which, in a few cases, allows them to be taken over by the souls of old angels, with only a faint memory of their former selves , available intermittently. In my novel, many of the victims perish, but a few characters can actually become angels, according to the rules of my game. On Monday, Jan. 18, PBS station WMPT in Maryland reran the one-hour American Experience documentary film “Influenza 1918)”, directed by Robert Kenner, tracing the history of the 1918 “Spanish Flu” pandemic. The best link, with the show transcript, is here. You can watch the video online with bonus material in author and director interviews, and you can purchase the DVD. There was a mild outbreak that started at Fort Riley, Kansas, in the spring, literally as a dust storm cleared. It gave some previews of its deadly nature then, but then subsided for the summer, to come back with full horror in the fall. The virus seemed to strike young adults the hardest, ironically because their immune systems, in their lungs, reacted so vigorously with a “cytokine storm”, drowning them in their own fluids in hours. The virus seemed to mutate into deadlier forms in Europe because of crowded conditions on the WWI front, and the country was preoccupied with war. President Woodrow Wilson had to send more troops over to replace those who had died of influenza, making a decision to send many GI’s to certain death. 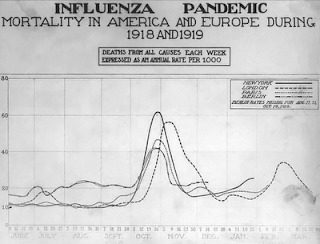 The pandemic was caused by an influenza-A virus of subtype H1N1, the same subtype as the apparently milder 2009 pandemic, sometimes called “swine flu” this year. Wikipedia estimates that 10-20% of those infected in 1918 died, some in a few hours. The loss of oxygen and circulation did damage to those who lived; some lost all their hair. The film provides an indirect warning to the effect that we had better get busy with a vaccine for H5N1 ("bird flu") as endemic in Southeast Asia but not readily transmittble person-to-person yet. But H5N1 (not the same as H1N1) could mutate and become a pandemic at any time. Even today. Wikipedia attribution link for picture of a chart showing mortality from the epidemic, here. Natural History Museum features "Plate Tectonics Theater"
The National Museum of Natural History has a new exhibit on the second floor about the Solar System and the origin of planets, and offers a 15 minute film “Plate Tectonics Theater.” The film shows volcanoes and earthquake faults all over the world, separating the seventeen plates (eight major and nine smaller). The film focuses on the supervolcano caldera under Yellowstone National Park in Wyoming and mentions that this caldera has given out three super eruptions in the past 1.5 million years, around the northwest. It hints that another eruption could occur at any time. It doesn’t mention the mid-continent dimple at New Madrid, MO, discussed on Good Morning America this morning, site of the largest tremor in recorded US history, with six months of huge aftershocks, with a cycle every 500 years. 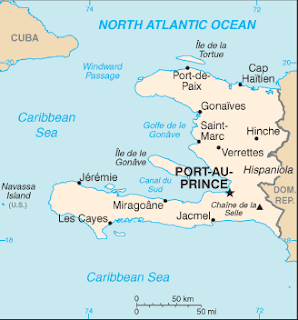 Haiti is near a major plate boundary in the Caribbean. "The Book of Eli": more "political" than "The Road"
That seems to explain “The War” that has destroyed civilization and left a desert wasteland in “The Book of Eli”, from Warner Brothers and Alcon, directed by Albert and Allen Hughes, written by Gary Whitta. Yes, it comes across as a companion piece to “The Road” from Dimension Films last November. This time, the colors are even more muted, the film often seeming to be almost in black and white (Cinemascope), and the message even more political. Denzel Washington plays Eli, who has been carrying this locked book for years, walking into western-type gunfights with nemesis played by Gary Oldman. He meets up with a female companion Solara played by Mila Kunia. The enemies are curious about what’s so special about the book, since The War destroyed all books (including the Internet) and even all “book smarts”. I suppose it was something like the thermonuclear war that could have occurred as a result of the Cuban Missile Crisis in 1962. It’s interesting to see society pushed back to older technology, with hand cranked Victrolas and the reinvented printing press. But there is nothing like memorizing the Bible, or encoding it in a physically cumbersome form. The world seems to have no electric grid, but gasoline trucks run, so the nuclear war EMP effect did not wipe out everything. The official international trailer is here. 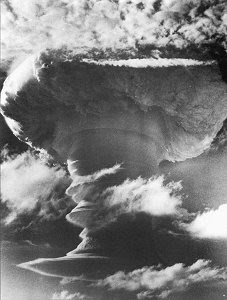 Wikipedia attribution link for Hydrogen Bomb picture. See Movies blog Oct. 28, 2010 for review of 1962 French film "La jetee" ("The Pier"), related subject matter. CBS News also provides a flyover video from Coast Guard Station Clearwater here, showing Port au Prince from the air. A 7.0 only ten miles away has to do massive damage. I was not aware that a major fault was present in the Caribbean. Unlike Florida, the land of that island, including the Dominican Republic also, is mountainous, as in Cuba. But there have been similar earthquakes in the 18th and 19th centuries near Boston and near Charleston SC and a major quake in New York City is conceivable. NBC Nightly News, however, on Wednesday discussed the Caribbean Plate which grates against the North American Plate, producing a fault. The quake Tuesday may have shifted tension further west to portend future quakes around Jamaica. The United Nations says that fourteen of its workers there are confirmed dead. At 6 PM Wednesday, ABC News was reporting over 100,000 deaths. I did volunteer at a phone bank in 2005 at the Red Cross in Falls Church Va over Hurricane Katrina, and found that most clients had to be put on hold for hours on a FEMA help line. The earthquake reminds me of a Christmas earthquake that leveled Managua, Nicaragua in 1972. Attribution link for Wikipedia CIA Factbook map of Haiti. The scuttlebutt in the media is that the film short “Panic Attack!" by Fede Alvarez about a robot attack on Montevideo, Uruguay, has drawn the interest of director Sam Rami, Ghost House, and I guess Sony Pictures. A little boy sees the robots approach a bridge, and pretty soon they launch a laser attack on the city. Supposedly the film cost just $300. 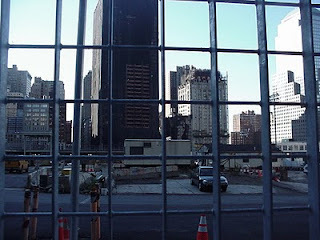 I post it on the “disaster movies” blog because it reminds me of Cloverfield (reviewed Jan. 2008). Here’s the story by Matt Goldberg on Collider, link. There are many variations of the video on Youtube, such as this. 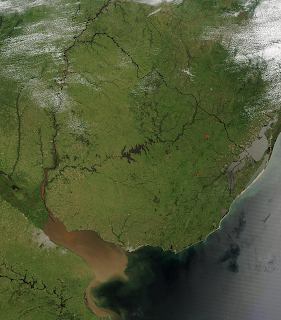 Wikipedia attribution link for NASA image of Uruguay. On Wednesday Jan 6 the History Channel ran “Apocalypse Man” in which a handsome bearded lean Rudy Reyes (Facebook link called "Hero Living") demonstrates survival techniques after civilization has broken down. The History Channel has a link here. Reyes recommended suspicion of everyone, and learning to travel by less known routes, including city sewer systems. He demonstrated how to make a fire with steel wool, and how to move into abandoned houses. He also showed how to bring the power back on in an abandoned hospital, and discussed what happened to hospitals in Hurricane Katrina. He also showed how to rappel down an elevator shaft and even rappel up a suspension river bridge. Have confidence in your ability, he said. In the film, he goes it alone. But he says that while he would be suspicious of everyone, wanting to find people to communicate with would give him a reason to live. The program struck me as a mini "Life After People"; well, maybe there are a few people. The mood also reminds one of the recent thriller "The Road". The History Channel is sponsoring “Apocalypse Week” to start January 2010, and Sunday night it ran “Apocalypse Island”, a two hour documentary. The link is here. This island is about 400 miles west of Chile, hard to reach because of violent currents most of the year. In 1995, a researcher and outdoorsman Jim Turner fell while hiking on the island. Only slightly injured, when he stopped he noticed a Mayan-like stone megalith. Research over the years showed that the megalith could be a particularly appropriate place to watch the solar eclipse 40 days before Dec 21 2012, as well as the transit of Venus. Some historians believe that the Mayans traveled to the South American coast, introducing corn, as well as North America, maybe influencing the mound builders in Ohio. In the second half of the film, Turner and a companion return to find and climb the megalith, and look for the “secret of 2012”. The megalith is perfectly elevated to see the events from June to Dec 21, 2012 as predicted by the Dresden Codex. The Mayans knew about the "Great Dark Rift" when the solar system components are aligned with the center of the Galaxy. The Dark Rift is the Center of the Milky Way, where a supermassive black hole lives. We had a similar event 13000 years ago with a sudden climate change. 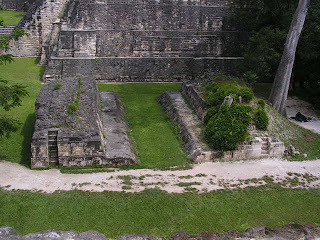 Wikipedia attribution link for picture of Tikal Ballcourt. A good comparison is MelGibson’s 2006 film for Touchstone, “Apocalypto”. .